Don’t trust your case to the insurance company. You might have been offered a somewhat compelling settlement, but it pales in comparison to what your injury case is actually worth. Insurance companies like to tell the victim that since there was little property damage to his or her vehicle, a judge and jury will not believe that anyone could have been injured in the crash. Yet, what insurance companies fail to mention is that motor vehicles today are built to withstand a 15 to 20 mph rear-end impact, but passengers are not. Only an experienced and proven personal injury lawyer can truly establish the full and fair value of your case and convince a jury of your actual long-term needs due to the serious injuries that you have sustained. At Carluzzo Rochkind & Smith, P.C., we maximize the value of our clients’ cases in in Manassas, Prince William, Manassas Park, Gainesville, Haymarket, Woodbridge, Lake Ridge, Dumfries, Bristow, Warrenton, Centreville, Fairfax, Stafford, Chantilly, Leesburg, Ashburn, Sterling, Herndon, Reston, Alexandria, Annandale, Arlington, and throughout Northern Virginia. 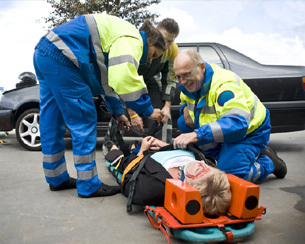 Our attorneys handling rear-end collision accident cases understand the nuances and complexities in such crashes. We won’t let the insurance company minimize the value of your claim or get away with denying your claim. Based in Manassas, our firm is established with a reputation that has been growing for over 25 years. We know our way around the court system, and we know the insurance defense lawyers who will be representing the opposing party in your case. As former insurance lawyers ourselves, we know their tactics and strategies, and we know how to counter their every move. The damage to your car does not tell the whole story of how badly you were injured. You could have been hit from behind at a stop light while the other driver was flying at 50 mph and walk away just fine. On the other hand, you could have been hit at just 10 mph and suffered a serious neck or head injury. A “minor” injury could turn out to be much more life-altering than you initially think. Call our office to schedule a free initial consultation with an attorney as soon as possible. Gain an understanding of your full legal options. Please contact us by email or call us at 703-361-0776 to schedule a meeting.